As a key piece of one of the NFL’s top defenses, the playmaking safety was voted the top player in the league at his position by a panel of 10 football writers for The Associated Press. 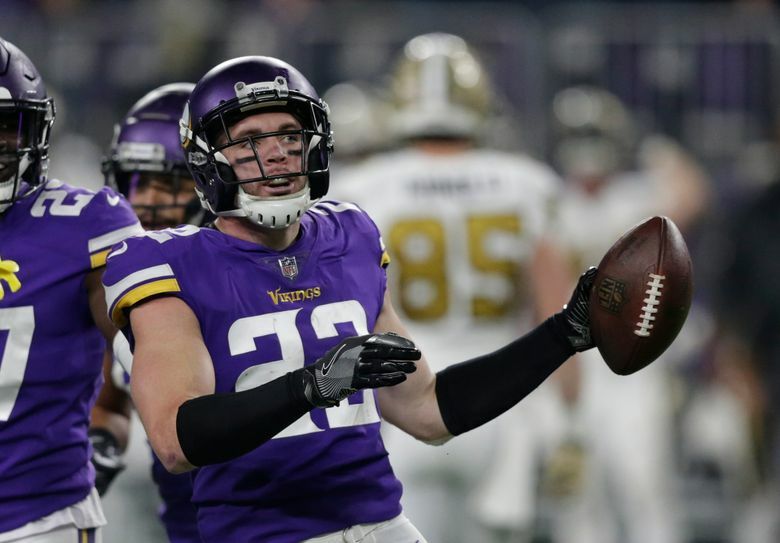 “The independent analysts at Pro Football Focus rated Smith’s performance in 2017 the highest by any player at any position in the league,” Minneapolis-based AP writer Dave Campbell said. “This year, the three-time Pro Bowl pick has three interceptions and three sacks in nine games. No player in the NFL hit both of those marks over the entire 2017 season. The AP voters overwhelmingly agreed. Smith received 97 points in a 10-points-to-one-point system, garnering eight of 10 first-place votes. He finished second on one ballot and third on the other to easily outdistance the New York Giants’ Landon Collins, who had 69 points. That’s saying a lot, particularly with a team that includes defensive end Danielle Hunter, who leads the NFL with 11½ sacks. “Smith is an elite pass defender who can bat away a throw or pick off a pass on one play, then sack the QB on the next,” Washington-based Howard Fendrich said. Smith finished second in last year’s voting, with Thomas winning. The injured Seahawks star, who’s out for the season with a broken left leg, had 59 points — and received one first-place vote, from Bay Area-based Josh Dubow — to finish third this year. “Thomas is still the benchmark at safety despite a season-ending injury,” Dubow said. Collins jumped up two spots after finishing fourth last year. He doesn’t have any interceptions yet this season, but has firmly established himself as one of the best at his position. “Yeah, he’s on a team with one win (entering Week 10), but Collins is strong tackler and pass defender,” New York-based Simmi Buttar said. Tennessee’s Kevin Byard is fourth with 54 points, but received the other first-place vote from Nashville-based Teresa M. Walker. Byard has two interceptions this season, and caused quite a stir with his star turn on his most recent pick. After intercepting Dak Prescott’s pass Monday night in Tennessee’s 28-14 victory at Dallas, Byard ran to the 50-yard line at AT&T Stadium and danced with his teammates on the Cowboys’ star logo. Sanders and Byard got into a Twitter feud in the offseason about who the league’s top safety is. Prime Time picked Tyrann Mathieu, who didn’t finish in the AP’s top 10. New England’s Devin McCourty was fifth with 38 points, and has been a model of consistency for Bill Belichick’s defense. “Anyone who can stick so long (nine years) on a revolving door that is the Patriots’ defense is a special performer,” Wilner said. McCourty was followed by Washington’s D.J. Swearinger, who had 36 points. “Swearinger does everything well, from coverage to run support to rushing the passer,” said Dubow, who had him ranked second on his ballot. The Jets’ Jamal Adams (24 points), Los Angeles Chargers rookie Derwin James (21), Baltimore’s Eric Weddle (20) and Kansas City’s Eric Berry (19) rounded out the top 10. Berry appeared on six ballots despite having not played since last year’s season opener.